Comments: Comments Off on Fit Radio Success Story – Meet Christopher F.
The time it took to create playlists or change songs was really taking away from my workout focus and intensity. With this app, I can open it up and get right to it, no matter what my energy level or mood is they have a genre that fits my needs. My favorite mix came recently during one of my interval treadmill runs and it had Spice Girls into Backstreet Boys. Talk about a throwback to the max! Fit Radio really shines with their new coaching feature that gives you in-ear commands paired with the best DJ mixes. It really helps you go the extra mile and finish strong. Another great part of the coaching feature is that they update the workouts every week so you will always be challenged to improve and never become complacent. 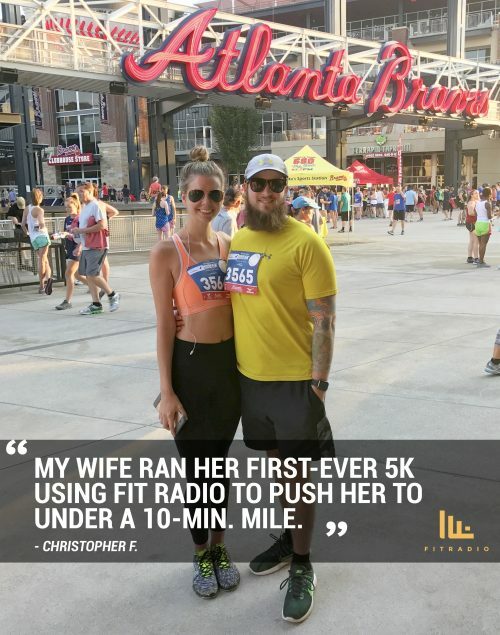 I cannot recommend Fit Radio enough and recently my wife ran her first ever 5K using the app to push her to under a 10-minute mile! Needless to say, we are going to be Fit Radio members for life! Download Fit Radio and see the difference yourself.